Designer dogs or hybrid dogs are very popular, and they are a cross of two purebreds to form a new mix. The Beagle Chihuahua mix, often called the Cheagle, is a very small, cute mix that many people find to be a faithful, loveable companion. They are recognized as a mixed breed by both the International Designer Canine Registry and the American Canine Hybrid Club. Of course, when you combine two breeds, you can never be completely sure how the puppies will turn out. However, here’s a closer look at what you can expect from a Cheagle when it comes to appearance, temperament, grooming needs, health, and more. The Beagle Chihuahua mix is a very recent mixed breed, and not much is known about the history of the hybrid. It’s likely that the mix only got its start within the past couple of decades, since this is the time when hybrids started to become very popular. To get a better idea of the origin of the Cheagle, it’s a good idea to look at the history of both the Chihuahua and the Beagle. No one is quite certain of the origin of the Beagle, and it’s thought that they may have a line that goes all the way back to the earliest scent hounds owned by the Romans. In the 1700s, small hounds known as Beagles were bred in England, although the modern Beagle wasn’t refined until later in the 1800s. Later, in the American south, a small dog known as a Beagle was used for hunting, and these dogs were imported to England, where General Richard Rowett began to work on refining the American Beagle breed. In 1885, the American Kennel Club recognized the Beagle. The Chihuahua also has a history shrouded in lore and legend. Evidence of tiny dogs that are very similar dates all the way back to the 9th century. Much of the dog’s history is purely speculation. 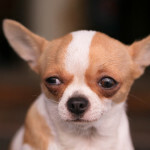 Some experts think that the Chihuahua has a European origin, while others think that they were brought to the Mexican area by the Aztecs from China. We do know that the first Chihuahuas to arrive in the United States in the middle 1800s. However, it wasn’t until 1904 that the American Kennel Club finally recognized this breed, and later in 1923, the Chihuahua Club of America would be formed. You can expect the Beagle Chihuahua mix to be a very small dog, standing somewhere between 9 and 14 inches tall when fully grown. These dogs will range between 9 and 20 pounds in weight. Usually they have the body like the Chihuahua, long floppy ears, and some of the markings of the Beagle. Their coat is shiny and short, and some of the common coat colors include cream, white, tan, black, and cream. In many cases, they are a mixture of several colors, although it’s possible for them to be a solid color. The Cheagle has dark, round, brown eyes and a long tail. Your Beagle Chihuahua will be a very friendly, playful dog that is outgoing and very excitable. They love their family and are very protective and loyal. These dogs may enjoy following scents and have energy to spare. However, they still enjoy plenty of time snuggling with their owners. Although the Beagle Chihuahua mix is a small dog, they are quite active. They enjoy running in a park or in a yard. Since they are very playful, these dogs enjoy playing games. It’s important to make sure the Cheagle gets 30 minutes each day of exercise to use up all that energy. Without enough activity, these dogs may become destructive, barking and chewing because they are bored. Sometimes training is a bit hard because the Beagle Chihuahua mix is so energetic. Training must be firm and consistent. House training can be difficult with small dogs, so it’s essential to begin training early. Even though the Beagle Chihuahua mix has a short coat, they do shed moderately. You’ll need to brush them regularly to prevent shedding. In most cases, the Cheagle only need to be bathed as needed with a dog shampoo. Eyes need to be checked each week and the ears should be wiped and checked weekly as well. They need to have their nails trimmed regularly, but if you’re not experienced, consider having this done by a professional groomer to avoid cutting the quick of the nail and causing the dog pain. The Beagle Chihuahua is not a working dog. However, they make excellent companion dogs.